Here at GS Decorating we thought we would do a quick overview of the best way to strip wallpaper. Stripping wallpaper can be a right pain in the preverbal and varies with the surface you are working with. But if you stick to these basic principles everything should run nice and smoothly in your home DIY project. We would reconmend you pop to your local DIY store and pick up an essentail bit of kit before you start to strip your wallpaper. We use Dulux trade, but any local hardware store worth their salt should stock this item. 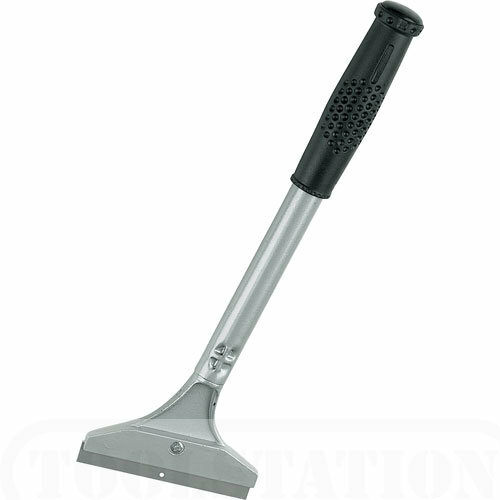 A long handled scraper with a 5mm blade (see picture), you can pick one of these up for under a tenner. Apart from your trusty long handled scrapper, all you’re going to need now, is a bucket, some boiling water, a big sponge, dust sheets, some plain brand washing up liquid, bin bags and a box of tea bags. If you are stripping a painted wall or lining paper you may also want to invest in one of these a wallpaper scorer. But if you dont want to splash out just make sure you score the paper using your scraper. You basically need to ensure water can seep through behind the wallpaper. Steamers in our opinion are just a waste of time and money. You will end up there for hours upon hours and get a bright red face from the steam to boot! Hopefully to all of you with common sense out there we shouldnt really need to explain this step. But just in case, we will give it a quick mention. Clean your room out as much as possible, lay dust sheets throughout your room ensuring they are right to the edge of the wall. Carpets don’t seem to take to kindly to wet damp wallpaper for some reason! There are many ways to prep a room and a professional will always take their time to do it properly ensuring minimum disruption to the room. However, for the purpose of this post, doing it properly is a whole another story and will be for another blog. This all depends on the paper you have on the wall and if you have invested in the wallpaper scorer as recommended above or using a blade. You need to ensure the wallpaper has been scored to allow the water behind the paper and loosen it from the wall. Right now this part is extremley straight forward but it’s amazing how many people don’t do this and dive straight in with their scrapper or steamer. Scraping away for hours to get every last inch of the paper off. Mix your washing up liquid with your boiling water and soak the walls. Simple! Get the walls extremely wet and… go put the kettle on! Sit down, read the paper, check your phone, do what ever you want. But leave the walls alone, don’t get that scrapper anywhere near to them yet. Depending on the amount of layers of wallpaper on your walls will relate to how many times you want to soak them. But we would recommend between three and five times. Just ensure the waters soapy, very hot, the walls get very wet and then you leave it at least twenty minutes between each soaking. All you need is a big old spounge and your away. As professional painters and decorators GS Decorating tend to soak the whole room in one go but dependant on your speed take sections at a time and by the time you have finished one section you will be ready for the next. What you will find, if you have soaked your walls properly, is that the hot soapy water has got behind the wallpaper and disolved the paste. With the aid of your trusty long handled scrapper this paper should now just glide off with very little effort at all. If you start and find the paper is not almost falling off the walls, then stop put your scrapper down and soak that wall again. Maybe time for another brew or two. As with everything in decorating, cleaning as you go along it paramount. Everyone has their own method with this. Do whatever works best for you. But we reconmend bagging up as often as possible, it makes it easier in the long run. Stripping a room may look a daunting challenge when you start but it doesn’t have to be hard work. By ensuring the hot water can get behind the wallpaper (whatever finish it is) and giving it enough time to soak through properly most rooms can be easily be striped.